Self-care does not restrict to only females. Our male counterparts also deserve some attention to this issue. There are some skin problems that are more prevalent among males and some issues tends to be more significant in them. In this issue, we'll have a look at some of the common facial skin problems among men. In a typical Asian country, being fair and spotless is one of the key attributes of beauty. Today, there are many ways beyond usage of creams and lotions to make one fairer and spotless; spots pertaining to ‘pigment spots’. 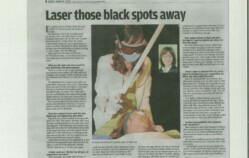 Laser has become increasingly popular as the ideal method for skin lightening and treatment of pigment spots. Dry skin : What to do? What comes to mind when you think of pollution? Probably not your shampoo, soap or hand lotion. But some of the chemicals found in personal care products aren't that pretty. U.S. researchers identified 10,500 industrial chemicals used as cosmetic ingredients, including carcinogens, pesticides, reproductive toxics, endocrine disruptors, plasticizers, degreasers and surfactants.